Okay. I'll just put it out there. Working, mothering, living, and wife-ing keep me very busy. Unfortunately, I just can't blog as regularly as I would like to. I hope I don't lose some good friends and followers, but it's going to be a little more sporadic until I can get things on track. Sorry and thanks for your patience! Now, onto something more fun. This summer, I spruced up my downstairs 1/2 bath for free. Remember this? I don't know if I was just never really "sold" on it, or if my D.A.D.D. is kicking in. Either way, it's getting changed. I feel like this room is seen by almost all of my guests, and it doesn't reflect me or say, "Hey, now! This lady knows how to decorate around a toilet, doesn't she?!" Love this. Love the towels, the color, the backsplash...but this isn't it. A tad too stark. Love this. 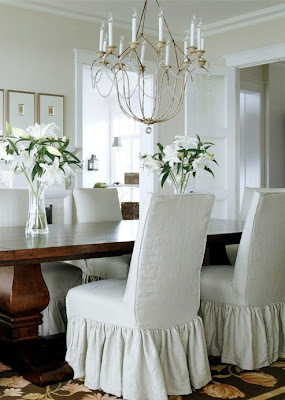 I love the chandelier, the draperies, the dark chair...but this isn't it. A tad too fancy. Love this. I love the rustic-ness, the jars, the colors, the wood...you guessed it. Not it. Unless I live in Key West, it's not working up here. Love this. I love the chandelier, the color, the wood, the simplicity...oh yeah, there's no toilet. And finally. Is this it? No, but it's pretty stinkin' close. It's just a tad...uh...not frilly enough? I don't want shabby chic, but I want some old, rustic wood in there. I want an ornate frame, a vintage coffee sack, and some typography. I want some architectural pieces. I think. So, what do you think? Am I the only one who knows what she wants, but doesn't? Maybe you're just sitting on THEE picture, and you want to send it my way. Perhaps you're sitting in my driveway waiting to come in here and design it for me. Regardless, some pretty pictures to look at, eh? YEAH, I GET WHAT YOUR SAYING. WHEN YOU SEE IT, YOU'LL KNOW. I WILL SEARCH A LITTLE AND LET YOU KNOW. I'm feeling the same way about too many rooms in my house. UGH!! I think part of the problem is winter - stuck inside to much to stare at all the things I just don't love!! I do love that last picture. From what you showed of your bathroom now you are almost there just needs a little tweeking. I think some old architectural pieces would be great, combine them with some great fabric to frilly it up a bit. Just a thought. I am sure whatever you do it will look awesome! I have a room that I am still trying to figure out! I have tons of pictures that I like but not the perfect thing for that room. I can definitely relate. Great pictures, though! You'll find it - don't settle for less than what you really love. No, I totally GET it. I mean, really. Because all of my life, I kept saying.......when I get older my house is going to be so beautiful! Everything will be just.so and I imagined that everything would be so picture perfect. And now that I have my own home, and I keep working towards my decorating goals, I just don't know how to get it picture perfect. I know what I love, and I can literally scour the internet for hours and what I love stands out clear as day. But how do I pull all of those elements together in my own home? Short of having an exact replica of a page in Country Living. Ya know? That said, I love your blog. I would never quit following b/c you don't crank out a certain quota on all of those wonderful ideas that we know you have. That wouldn't be a real friendship, and that's what I strive for, even in Blogland. i think that keeping our priorities in order makes us real 'nesters' don't you. our families and responsibilities come first - then hobbies:) sometimes it's hard to think of blogging as a hobby... real followers will keep coming back, i know i will. Do any elements in this room work for you, or is this too fancy too? A woman who tells the truth. You don't have enough time to do everything, at least to do it as effeciently as you want. I am so glad that I am not the only one who sometimes wishes that there were a few more hours in the day. I love the pics.Bathrooms are hard. They are small, there is a large toilet and a lot of people that frequent the space. I have yet to conquer this space. Let me know when you do. I have a giveaway. Please come and see! I think your pictures are great and I immediately thought about a post I read earlier from Melissa at The Inspired Room. She wrote about her kitchen but it had very similar characteristics as you desire. Her kitchen was ragged in yellowish, greenish cream, making it look airy and open. Along with a chair rail (in our bathroom we even extended it higher up to give it a different look) you could put beadboard or subway tile along the walls. She incorporated some darker wood architectural pieces which you could use an old dresser with a sink, or a framed mirror...I wish I could go shopping with you! I know your project will turn out beautifully. I hear ya! If I run across a picture I will surely let you know. I love how you think! I rarely take the time to scour for pictures which I know would help my blind eye at times! I totally agree with your taste! I did read from another blogger about getting coffee bags from a local coffee roaster, maybe you can cut one up and put around a mat for a frame and find some sort of sepia picture to put in the frame or simply frame the piece of the bag and put scrapbook letters or charms on top in the feel you are looking for. I already admire you because I have that same white cabinet but it is filled with everything we use so it is a bit of a busy eyesore...I have thought about using scrapbook paper on the inside of the glass to cover it. Good luck! I will try to keep brainstorming! 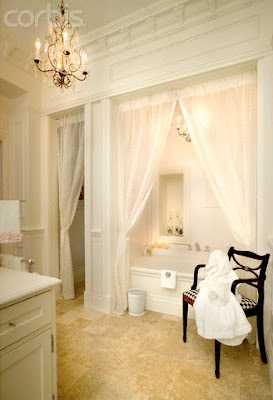 I would love a chandelier in a bathroom as well, so chic looking! I know exactly what you mean. I'm trying to finish my daughter's room and I just can't think of some extra pieces to pull it all together. I know what I want, but I can't get it right! I am right with you on the blogging thing. It is something I enjoy, but can take away from my other priorities if I let it. I keep deliberating about how much time I can devote to blogging and may have to scale back if I can't find a little more balance in my life. I love what you did with the room so far, so am anxious to see where it will go from here. One question: How do you explain to dh that you want to re-do something you have already done. Does he think that is a waste? Mine does not always grasp my visions or why they are important to me. How do you get him on board? 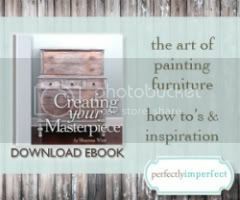 I'm a dreamer, too, and now these pictures are making me drool and want to do some re-decorating! I think many of us can relate to that feeling. All those rooms are beautiful and I know you'll get it right. Can't wait to see what you come up with! Take your time though, do it when you can. We'll still be here! Hey, I have some pictures for inspiration for you and some ideas, but I didn't know how to put them in this comment, so I emailed you. Good luck on your bathroom! I feel like that all the time! I did my bedroom twice because of that. Of course, NOW I love it. It's the main living area that I'm struggling with right now. I know what I want, but it's just not...Well, you know. In my bedroom I found that once I found ONE thing that fit with what I wanted, the rest just kinda fell into place. I'm sure I've got some bathroom pictures somewhere on this computer... I'll see what I can dig up. 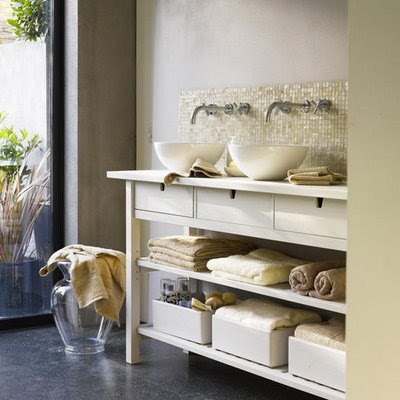 I have that same bathroom cabinet in my guest room...I love it! Life has been busy lately for everyone! ok Girl...I have ideas for ya. You want hopsack? Put it on the walls (grasscloth wallpaper) you want rustic wood? An old piece for a vanity...with a vessel sink. You want arch elements? Turn them into something useful...like a towel holder. I did most of the above in the kids bathroom...see if anything rings with you? You'll find what you are looking for...tincture of time! I totally relate! I am actually posting about this same thing this morning! What I did was find a bunch of pictures I liked (like you did!) and then picked out the common elements in each one that I liked... then listed those and realized THAT was what I need to add to my room! Finding the common denominator in all the pictures you like and then creating it will make it your own! I love the way it looks currently, but I get what you're saying! SO frustrating when you can't find what you're seeing in your head :)!! What I noticed by looking at all of your inspiration pics is that all of them have a soft, vintage element to them, and all of them have a soft creamy white or pale linen on the walls. Maybe you're wanting a fresh, airy space that is monochromatic and peaceful. Use one great architectural piece as a focal point, and go simple and light for the rest of the room! Try combining what you like from each pic, and that's your style! I have sooo been there and back. I feel that way in my bedroom. I know what I think I want but just cant seem to pull it together without spending my life savings. Its really hard when on a budget,and no direction. Thats when I just sit and wait. Wait on pictures like you have just shared, Thanks and I hope you find the "one"! It seems to me that you are kinda leaning towards the monochromatic look like I am. I want lots of white, off-white, taupe with pops of black and brown. I want some rustic AND modern pieces as well as a bit of flirt, whimsy and romance. I did a post last month on my blog that has alot of these types of pictures in it, perhaps one of them is what you are looking for? I am in the same boat as you.......I see it in my head but can't get it "on paper". 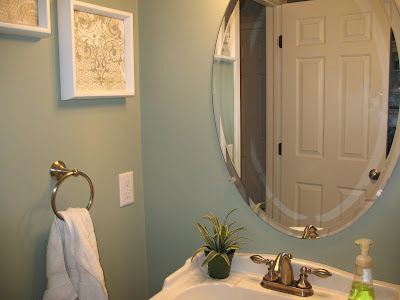 Here's an idea: Just take what you like from every picture, and incorporate those things into your bathroom. Leave out what you don't like in the pictures. That should be the solution to the bathroom of your dreams! Sometimes, it's not that simple, but with your decorating skills, it should be possible! You are SO SO SO SO not alone. Not sure how I found you, but you have given me so many inspirations (even if they only show up in my dreams). And I totally get what you are saying. Sorry I don't have any pics to send your way. Anyway, thanks for sharing all the pics and your ideas. Love them!! I don't even know what to say because I love your bathroom so much already!! I love the pics, Chris. Like you, I have DADD, and it would be hard to whittle down a specific design. What happens to me is a room just stays the way it is till I can finally decide on something. Nice to know I'm not alone. Life has been BUSY in our house, too, so I've been majorly slacking at posting and commenting! So don't feel like you're flying solo girl! I feel like I know what I want but don't know at the same time in about my whole house right now. I'm in a decorating rut. Hope you figure out your bathroom soon! I know it will be super! The backsplash in that first inspiration picture is ridiculous! I'm in love. This is my first visit to your site. You are creative, witty, and have a tongue-in-cheek sense of humor I have been enjoying very much! I know exactly what you mean...it took me 5 years to find *the* armoire to use as an entertainment cabinet. I spotted it the moment I walked into the store and bought it on the spot! I've been the same way with bedding for the master bedroom forEVER. I love that last picture. And I have SO been where you're at. Maybe right now! Have fun with your redesign! Sooo...you are putting a ruffle around the toilet? That will NOT work, Chris. Duh. Think of the bleach you will have to stock up on. That will *not* fit all on your cute garage shelf either. I love the shelf and pictures. I'm not sure about the round basket in there. I can see some rustic wood. Just don't make it look too "out-housie" with it. OMG I just wrote the word "out-housie." I should not be commenting this late at night. And how could you lose friends and followers? All you need are a few cute accessories and you are good to go. No pun intended. I've been there with the waiting till I know what I want 100%. (Marriage to Dan was the #1 waiting) now it's my master bedroom. Till then my Ethan Allen set from when I was in high school works for us. PS...if you kept up a daily blog of wonderfulness and design amazement I would be shocked. Who can do that?! I can't let blogging take over - because when it becomes an obligation it ceases to be FUN. I totally understand. I still haven't done anything with my bathroom since I moved in, 2 months ago, and it's driving me crazy. I simply don't know what I want. Love your blog so I am giving you a blog award. Please stop by and get it. I love all your inspiration pictures. I am re-doing my kitchen and I feel like you. I can't seem to say what I want. Hope it comes together soon. I'm sure it will be beautiful! I feel that way ALL THE TIME....I lived most of my college career in design school struggling to get my ideas on paper. I think you've got a great start!! I know exactly what you mean. I know whatever you do it is going to be beautiful. Hope you find it soon. I have zero inspiration for your powder room, but I did post about your teacher's gift today. I feel the exact same way that you do about my powder room, so I am anxious for what you decide. I have only thought about paint color (beige to deep red) and picture changes (travel poster to b/w kids'). But don't you think family photos in the bathroom is a bit odd? I hear ya', girl! After reading this post I had to write about my bathroom woes. Good luck! Just wondering where you got the white cabinet, its absolutely gorgeous and just what I have been looking for. I love, and I can literally scour the internet for hours and what I love stands out clear as day.